The process of ulceration may be defined as the molecular or cellular death of tissue taking place on a free surface. It is essentially of the same nature as the process of suppuration, only that the purulent discharge, instead of collecting in a closed cavity and forming an abscess, at once escapes on the surface. An ulcer is an open wound or sore in which there are present certain conditions tending to prevent it undergoing the natural process of repair. Of these, one of the most important is the presence of pathogenic bacteria, which by their action not only prevent healing, but so irritate and destroy the tissues as to lead to an actual increase in the size of the sore. Interference with the nutrition of a part by œdema or chronic venous congestion may impede healing; as may also induration of the surrounding area, by preventing the contraction which is such an important factor in repair. Defective innervation, such as occurs in injuries and diseases of the spinal cord, also plays an important part in delaying repair. In certain constitutional conditions, too—for example, Bright's disease, diabetes, or syphilis—the vitiated state of the tissues is an impediment to repair. Mechanical causes, such as unsuitable dressings or ill-fitting appliances, may also act in the same direction. Clinical Examination of an Ulcer.—In examining any ulcer, we observe—(1) Its base or floor, noting the presence or absence of granulations, their disposition, size, colour, vascularity, and whether they are depressed or elevated in relation to the surrounding parts. (2) The discharge as to quantity, consistence, colour, composition, and odour. (3) The edges, noting particularly whether or not the marginal epithelium is attempting to grow over the surface; also their shape, regularity, thickness, and whether undermined or overlapping, everted or depressed. (4) The surrounding tissues, as to whether they are congested, œdematous, inflamed, indurated, or otherwise. (5) Whether or not there is pain or tenderness in the raw surface or its surroundings. (6) The part of the body on which it occurs, because certain ulcers have special seats of election—for example, the varicose ulcer in the lower third of the leg, the perforating ulcer on the sole of the foot, and so on. The Healing Sore.—If a portion of skin be excised aseptically, and no attempt made to close the wound, the raw surface left is soon covered over with a layer of coagulated blood and lymph. In the course of a few days this is replaced by the growth of granulations, which are of uniform size, of a pinkish-red colour, and moist with a slight serous exudate containing a few dead leucocytes. They grow until they reach the level of the surrounding skin, and so fill the gap with a fine velvety mass of granulation tissue. At the edges, the young epithelium may be seen spreading in over the granulations as a fine bluish-white pellicle, which gradually covers the sore, becoming paler in colour as it thickens, and eventually forming the smooth, non-vascular covering of the cicatrix. There is no pain, and the surrounding parts are healthy. This may be used as a type with which to compare the ulcers seen at the bedside, so that we may determine how far, and in what particulars, these differ from the type; and that we may in addition recognise the conditions that have to be counteracted before the characters of the typical healing sore are assumed. For purposes of contrast we may indicate the characters of an open sore in which bacterial infection with pathogenic bacteria has taken place. The layer of coagulated blood and lymph becomes liquefied and is thrown off, and instead of granulations being formed, the tissues exposed on the floor of the ulcer are destroyed by the bacterial toxins, with the formation of minute sloughs and a quantity of pus. The discharge is profuse, thin, acrid, and offensive, and consists of pus, broken-down blood-clot, and sloughs. The edges are inflamed, irregular, and ragged, showing no sign of growing epithelium—on the contrary, the sore may be actually increasing in area by the breaking-down of the tissues at its margins. The surrounding parts are hot, red, swollen, and œdematous; and there is pain and tenderness both in the sore itself and in the parts around. Classification of Ulcers.—The nomenclature of ulcers is much involved and gives rise to great confusion, chiefly for the reason that no one basis of classification has been adopted. Thus some ulcers are named according to the causes at work in producing or maintaining them—for example, the traumatic, the septic, and the varicose ulcer; some from the constitutional element present, as the gouty and the diabetic ulcer; and others according to the condition in which they happen to be when seen by the surgeon, such as the weak, the inflamed, and the callous ulcer. So long as we retain these names it will be impossible to find a single basis for classification; and yet many of the terms are so descriptive and so generally understood that it is undesirable to abolish them. We must therefore remain content with a clinical arrangement of ulcers,—it cannot be called a classification,—considering any given ulcer from two points of view: first its cause, and second its present condition. This method of studying ulcers has the practical advantage that it furnishes us with the main indications for treatment as well as for diagnosis: the cause must be removed, and the condition so modified as to convert the ulcer into an aseptic healing sore. Ulcers due to Traumatism.—Traumatism in the form of a crush or bruise is a frequent cause of ulcer formation, acting either by directly destroying the skin, or by so diminishing its vitality that it is rendered a suitable soil for bacteria. If these gain access, in the course of a few days the damaged area of skin becomes of a greyish colour, blebs form on it, and it undergoes necrosis, leaving an unhealthy raw surface when the slough separates. Heat and prolonged exposure to the Röntgen rays or to radium emanations act in a similar way. The pressure of improperly padded splints or other appliances may so far interfere with the circulation of the part pressed upon, that the skin sloughs, leaving an open sore. This is most liable to occur in patients who suffer from some nerve lesion—such as anterior poliomyelitis, or injury of the spinal cord or nerve-trunks. Splint-pressure sores are usually situated over bony prominences, such as the malleoli, the condyles of the femur or humerus, the head of the fibula, the dorsum of the foot, or the base of the fifth metatarsal bone. 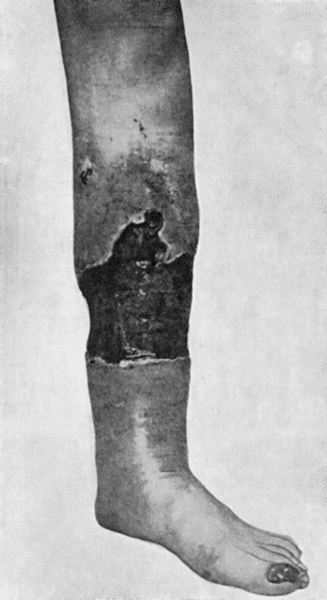 On removing the splint, the skin of the part pressed upon is found to be of a red or pink colour, with a pale grey patch in the centre, which eventually sloughs and leaves an ulcer. Certain forms of bed-sore are also due to prolonged pressure. Pressure sores are also known to have been produced artificially by malingerers and hysterical subjects. Fig. 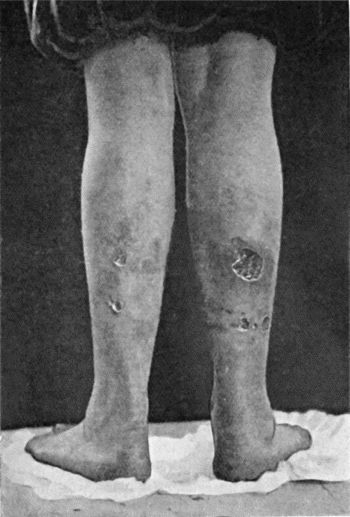 14.—Leg Ulcers associated with Varicose Veins and Pigmentation of the Skin. Ulcers due to Imperfect Circulation.—Imperfect circulation is an important causative factor in ulceration, especially when it is the venous return that is defective. This is best illustrated in the so-called leg ulcer, which occurs most frequently on the front and medial aspect of the lower third of the leg. At this point the anastomosis between the superficial and deep veins of the leg is less free than elsewhere, so that the extra stress thrown upon the surface veins interferes with the nutrition of the skin (Hilton). 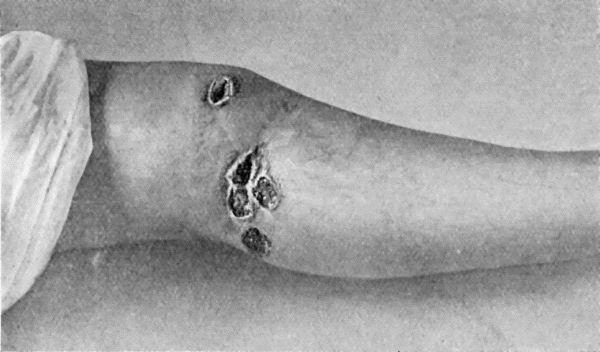 The importance of imperfect venous return in the causation of such ulcers is evidenced by the fact that as soon as the condition of the circulation is improved by confining the patient to bed and elevating the limb, the ulcer begins to heal, even although all methods of local treatment have hitherto proved ineffectual. In a considerable number of cases, but by no means in all, this form of ulcer is associated with the presence of varicose veins, and in such cases it is spoken of as the varicose ulcer (Fig. 14). 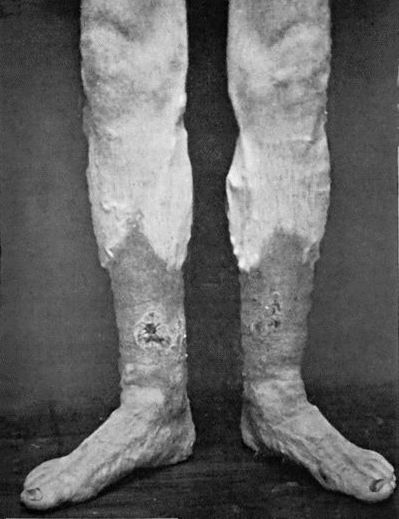 The presence of varicose veins is frequently associated with a diffuse brownish or bluish pigmentation of the skin of the lower third of the leg, or with an obstinate form of dermatitis (varicose eczema), and the scratching or rubbing of the part is liable to cause a breach of the surface and permit of infection which leads to ulceration. Varicose ulcers may also originate from the bursting of a small peri-phlebitic abscess. Varicose veins in immediate relation to the base of a large chronic ulcer usually become thrombosed, and in time are reduced to fibrous cords, and therefore in such cases hæmorrhage is not a common complication. In smaller and more superficial ulcers, however, the destructive process is liable to implicate the wall of the vessel before the occurrence of thrombosis, and to lead to profuse and it may be dangerous bleeding. These ulcers are at first small and superficial, but from want of care, from continued standing or walking, or from injudicious treatment, they gradually become larger and deeper. They are not infrequently multiple, and this, together with their depth, may lead to their being mistaken for ulcers due to syphilis. The base of the ulcer is covered with imperfectly formed, soft, œdematous granulations, which give off a thin sero-purulent discharge. The edges are slightly inflamed, and show no evidence of healing. The parts around are usually pigmented and slightly œdematous, and as a rule there is little pain. This variety of ulcer is particularly prone to pass into the condition known as callous. In anæmic patients, especially young girls, ulcers are occasionally met with which have many of the clinical characters of those associated with imperfect venous return. They are slow to heal, and tend to pass into the condition known as weak. Ulcers due to Interference with Nerve-Supply.—Any interference with the nerve-supply of the superficial tissues predisposes to ulceration. For example, trophic ulcers are liable to occur in injuries or diseases of the spinal cord, in cerebral paralysis, in limbs weakened by poliomyelitis, in ascending or peripheral neuritis, or after injuries of nerve-trunks. The acute bed-sore is a rapidly progressing form of ulceration, often amounting to gangrene, of portions of skin exposed to pressure when their trophic nerve-supply has been interfered with. Fig. 15.—Perforating Ulcers of Sole of Foot. 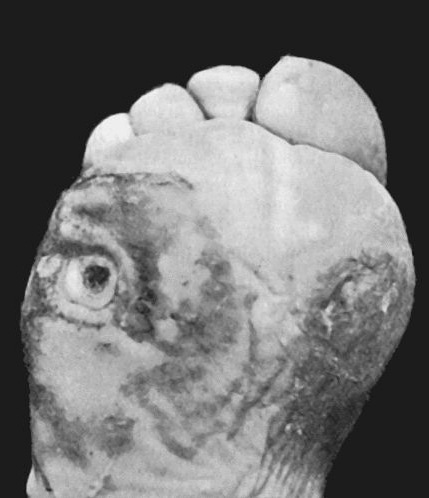 The perforating ulcer of the foot is a peculiar type of sore which occurs in association with the different forms of peripheral neuritis, and with various lesions of the brain and spinal cord, such as general paralysis, locomotor ataxia, or syringo-myelia (Fig. 15). It also occurs in patients suffering from glycosuria, and is usually associated with arterio-sclerosis—local or general. Perforating ulcer is met with most frequently under the head of the metatarsal bone of the great toe. A callosity forms and suppuration occurs under it, the pus escaping through a small hole in the centre. The process slowly and gradually spreads deeper and deeper, till eventually the bone or joint is reached, and becomes implicated in the destructive process—hence the term “perforating ulcer.” The flexor tendons are sometimes destroyed, the toe being dorsiflexed by the unopposed extensors. The depth of the track being so disproportionate to its superficial area, the condition closely simulates a tuberculous sinus, for which it is liable to be mistaken. The raw surface is absolutely insensitive, so that the probe can be freely employed without the patient even being aware of it or suffering the least discomfort—a significant fact in diagnosis. The cavity is filled with effete and decomposing epidermis, which has a most offensive odour. The chronic and intractable character of the ulcer is due to interference with the trophic nerve-supply of the parts, and to the fact that the epithelium of the skin grows in and lines the track leading down to the deepest part of the ulcer and so prevents closure. While they are commonest on the sole of the foot and other parts subjected to pressure, perforating ulcers are met with on the sides and dorsum of the foot and toes, on the hands, and on other parts where no pressure has been exerted. The tuberculous ulcer, so often seen in the neck, in the vicinity of joints, or over the ribs and sternum, usually results from the bursting through the skin of a tuberculous abscess. The base is soft, pale, and covered with feeble granulations and grey shreddy sloughs. The edges are of a dull blue or purple colour, and gradually thin out towards their free margins, and in addition are characteristically undermined, so that a probe can be passed for some distance between the floor of the ulcer and the thinned-out edges. Thin, devitalised tags of skin often stretch from side to side of the ulcer. The outline is irregular; small perforations often occur through the skin, and a thin, watery discharge, containing grey shreds of tuberculous debris, escapes. Bazin's Disease.—This term is applied to an affection of the skin and subcutaneous tissue which bears certain resemblances to tuberculosis. It is met with almost exclusively between the knee and the ankle, and it usually affects both legs. It is commonest in girls of delicate constitution, in whose family history there is evidence of a tuberculous taint. The patient often presents other lesions of a tuberculous character, notably enlarged cervical glands, and phlyctenular ophthalmia. The tubercle bacillus has rarely been found, but we have always observed characteristic epithelioid cells and giant cells in sections made from the edge or floor of the ulcer. Fig. 16.—Bazin's Disease in a girl æt. 16. The condition begins by the formation in the skin and subcutaneous tissue of dusky or livid nodules of induration, which soften and ulcerate, forming small open sores with ragged and undermined edges, not unlike those resulting from the breaking down of superficial syphilitic gummata (Fig. 16). Fresh crops of nodules appear in the neighbourhood of the ulcers, and in turn break down. While in the nodular stage the affection is sometimes painful, but with the formation of the ulcer the pain subsides. The disease runs a chronic course, and may slowly extend over a wide area in spite of the usual methods of treatment. After lasting for some months, or even years, however, it may eventually undergo spontaneous cure. The most satisfactory treatment is to excise the affected tissues and fill the gap with skin-grafts. Fig. 17.—Syphilitic Ulcers in region of Knee, showing punched-out appearance and raised indurated edges. The syphilitic ulcer is usually formed by the breaking down of a cutaneous or subcutaneous gumma in the tertiary stage of syphilis. When the gummatous tissue is first exposed by the destruction of the skin or mucous membrane covering it, it appears as a tough greyish slough, compared to “wash leather,” which slowly separates and leaves a more or less circular, deep, punched-out gap which shows a few feeble unhealthy granulations and small sloughs on its floor. The edges are raised and indurated; and the discharge is thick, glairy, and peculiarly offensive. The parts around the ulcer are congested and of a dark brown colour. There are usually several such ulcers together, and as they tend to heal at one part while they spread at another, the affected area assumes a sinuous or serpiginous outline. Syphilitic ulcers may be met with in any part of the body, but are most frequent in the upper part of the leg (Fig. 17), especially around the knee-joint in women, and over the ribs and sternum. On healing, they usually leave a depressed and adherent cicatrix. The scorbutic ulcer occurs in patients suffering from scurvy, and is characterised by its prominent granulations, which show a marked tendency to bleed, with the formation of clots, which dry and form a spongy crust on the surface. In gouty patients small ulcers which are exceedingly irritable and painful are liable to occur. Ulcers associated with Malignant Disease.—Cancer and sarcoma when situated in the subcutaneous tissue may destroy the overlying skin so that the substance of the tumour is exposed. The fungating masses thus produced are sometimes spoken of as malignant ulcers, but as they are essentially different in their nature from all other forms of ulcers, and call for totally different treatment, it is best to consider them along with the tumours with which they are associated. Rodent ulcer, which is one form of cancer of the skin, will be discussed with new growths of the skin. B. Arrangement of Ulcers according to their Condition.—Having arrived at an opinion as to the cause of a given ulcer, and placed it in one or other of the preceding groups, the next question to ask is, In what condition do I find this ulcer at the present moment? Any ulcer is in one of three states—healing, stationary, or spreading; although it is not uncommon to find healing going on at one part while the destructive process is extending at another. The Healing Condition.—The process of healing in an ulcer has already been studied, and we have learned that it takes place by the formation of granulation tissue, which becomes converted into connective tissue, and is covered over by epithelium growing in from the edges. Those ulcers which are stationary—that is, neither healing nor spreading—may be in one of several conditions. The Weak Condition.—Any ulcer may get into a weak state from receiving a blood supply which is defective either in quantity or in quality. The granulations are small and smooth, and of a pale yellow or grey colour, the discharge is small in amount, and consists of thin serum and a few pus cells, and as this dries on the edges it forms scabs which interfere with the growth of epithelium. Should the part become œdematous, either from general causes, such as heart or kidney disease, or from local causes, such as varicose veins, the granulations share in the œdema, and there is an abundant serous discharge. The excessive use of moist dressings leads to a third variety of weak ulcer—namely, one in which the granulations become large, soft, pale, and flabby, projecting beyond the level of the skin and overlapping the edges, which become pale and sodden. The term “proud flesh” is popularly applied to such redundant granulations. Fig. 18.—Callous Ulcer, showing thickened edges and indurated swelling of surrounding parts. The Callous Condition.—This condition is usually met with in ulcers on the lower third of the leg, and is often associated with the presence of varicose veins. It is chiefly met with in hospital practice. The want of healing is mainly due to impeded venous return and to œdema and induration of the surrounding skin and cellular tissues (Fig. 18). The induration results from coagulation and partial organisation of the inflammatory effusion, and prevents the necessary contraction of the sore. The base of a callous ulcer lies at some distance below the level of the swollen, thickened, and white edges, and presents a glazed appearance, such granulations as are present being unhealthy and irregular. The discharge is usually watery, and cakes in the dressing. When from neglect and want of cleanliness the ulcer becomes inflamed, there is considerable pain, and the discharge is purulent and often offensive. The prolonged hyperæmia of the tissues in relation to a callous ulcer of the leg often leads to changes in the underlying bones. The periosteum is abnormally thick and vascular, the superficial layers of the bone become injected and porous, and the bones, as a whole, are thickened. In the macerated bone “the surface is covered with irregular, stalactite-like processes or foliaceous masses, which, to a certain extent, follow the line of attachment of the interosseous membrane and of the intermuscular septa” (Cathcart) (Fig. 19). When the whole thickness of the soft tissues is destroyed by the ulcerative process, the area of bone that comes to form the base of the ulcer projects as a flat, porous node, which in its turn may be eroded. These changes as seen in the macerated specimen are often mistaken for disease originating in the bone. Fig. 19.—Tibia and Fibula, showing changes due to chronic ulcer of leg. The irritable condition is met with in ulcers which occur, as a rule, just above the external malleolus in women of neurotic temperament. They are small in size and have prominent granulations, and by the aid of a probe points of excessive tenderness may be discovered. These, Hilton believed, correspond to exposed nerve filaments. Ulcers which are spreading may be met with in one of several conditions. The Inflamed Condition.—Any ulcer may become acutely inflamed from the access of fresh organisms, aided by mechanical irritation from trauma, ill-fitting splints or bandages, or want of rest, or from chemical irritants, such as strong antiseptics. The best clinical example of an inflamed ulcer is the venereal soft sore. The base of the ulcer becomes red and angry-looking, the granulations disappear, and a copious discharge of thin yellow pus, mixed with blood, escapes. Sloughs of granulation tissue or of connective tissue may form. The edges become red, ragged, and everted, and the ulcer increases in size by spreading into the inflamed and œdematous surrounding tissues. Such ulcers are frequently multiple. Pain is a constant symptom, and is often severe, and there is usually some constitutional disturbance. The phagedænic condition is the result of an ulcer being infected with specially virulent bacteria. It occurs in syphilitic ulcers, and rapidly leads to a widespread destruction of tissue. It is also met with in the throat in some cases of scarlet fever, and may give rise to fatal hæmorrhage by ulcerating into large blood vessels. All the local and constitutional signs of a severe septic infection are present. Treatment of Ulcers.—An ulcer is not only an immediate cause of suffering to the patient, crippling and incapacitating him for his work, but is a distinct and constant menace to his health: the prolonged discharge reduces his strength; the open sore is a possible source of infection by the organisms of suppuration, erysipelas, or other specific diseases; phlebitis, with formation of septic emboli, leading to pyæmia, is liable to occur; and in old persons it is not uncommon for ulcers of long standing to become the seat of cancer. In addition, the offensive odour of many ulcers renders the patient a source of annoyance and discomfort to others. The primary object of treatment in any ulcer is to bring it into the condition of a healing sore. When this has been effected, nature will do the rest, provided extraneous sources of irritation are excluded. Steps must be taken to facilitate the venous return from the ulcerated part, and to ensure that a sufficient supply of fresh, healthy blood reaches it. The septic element must be eliminated by disinfecting the ulcer and its surroundings, and any other sources of irritation must be removed. If the patient's health is below par, good nourishing food, tonics, and general hygienic treatment are indicated. Management of a Healing Sore.—Perhaps the best dressing for a healing sore is a layer of Lister's perforated oiled-silk protective, which is made to cover the raw surface and the skin for about a quarter of an inch beyond the margins of the sore. Over this three or four thicknesses of sterilised gauze, wrung out of eusol, creolin, or sterilised water, are applied, and covered by a pad of absorbent wool. As far as possible the part should be kept at rest, and the position should be adjusted so as to favour the circulation in the affected area. The dressing may be renewed at intervals, and care must be taken to avoid any rough handling of the sore. Any discharge that lies on the surface should be removed by a gentle stream of lotion rather than by wiping. The area round the sore should be cleansed before the fresh dressing is applied. In some cases, healing goes on more rapidly under a dressing of weak boracic ointment (one-quarter the strength of the pharmacopœial preparation). The growth of epithelium may be stimulated by a 6 to 8 per cent. ointment of scarlet-red. Dusting powders and poultice dressings are best avoided in the treatment of healing sores. In extensive ulcers resulting from recent burns, if the granulations are healthy and aseptic, skin-grafts may safely be placed on them directly. If, however, their asepticity cannot be relied upon, it is necessary to scrape away the superficial layer of the granulations, the young fibrous tissue underneath being conserved, as it is sufficiently vascular to nourish the grafts placed on it. Treatment of Special Varieties of Ulcers.—Before beginning to treat a given ulcer, two questions have to be answered—first, What are the causative conditions present? and second, In what condition do I find the ulcer?—in other words, In what particulars does it differ from a healthy healing sore? If the cause is a local one, it must be removed; if a constitutional one, means must be taken to counteract it. This done, the condition of the ulcer must be so modified as to bring it into the state of a healing sore, after which it will be managed on the lines already laid down. Treatment in relation to the Cause of the Ulcer.—Traumatic Group.—The prophylaxis of these ulcers consists in excluding bacteria, by cleansing crushed or bruised parts, and applying sterilised dressings and properly adjusted splints. If there is reason to fear that the disinfection has not been complete, a Bier's constricting bandage should be applied for some hours each day. These measures will often prevent a grossly injured portion of skin dying, and will ensure asepticity should it do so. In the event of the skin giving way, the same form of dressing should be continued till the slough has separated and a healthy granulating surface is formed. The protective dressing appropriate to a healing sore is then substituted. Pressure sores are treated on the same lines. The treatment of ulcers caused by burns and scalds will be described later. In ulcers of the leg due to interference with the venous return, the primary indication is to elevate the limb in order to facilitate the flow of the blood in the veins, and so admit of fresh blood reaching the part. The limb may be placed on pillows, or the foot of the bed raised on blocks, so that the ulcer lies on a higher level than the heart. Should varicose veins be present, the question of operative treatment must be considered. When an imperfect nerve supply is the main factor underlying ulcer formation, prophylaxis is the chief consideration. In patients suffering from spinal injuries or diseases, cerebral paralysis, or affections of the peripheral nerves, all sources of irritation, such as ill-fitting splints, tight bandages, moist applications, and hot bottles, should be avoided. Any part liable to pressure, from the position of the patient or otherwise, must be carefully protected by pads of wool, air-cushions, or water-bags, and must be kept absolutely dry. The skin should be hardened by daily applications of methylated spirit. Should an ulcer form in spite of these precautions, the mildest antiseptics must be employed for bathing and dressing it, and as far as possible all dressings should be dry. The perforating ulcer of the foot calls for special treatment. To avoid pressure on the sole of the foot, the patient must be confined to bed. As the main local obstacle to healing is the down-growth of epithelium along the sides of the ulcer, this must be removed by the knife or sharp spoon. The base also should be excised, and any bone which may have become involved should be gouged away, so as to leave a healthy and vascular surface. The cavity thus formed is stuffed with bismuth or iodoform gauze and encouraged to heal from the bottom. As the parts are insensitive an anæsthetic is not required. After the ulcer has healed, the patient should wear in his boot a thick felt sole with a hole cut out opposite the situation of the cicatrix. When a joint has been opened into, the difficulty of thoroughly getting rid of all unhealthy and infected granulations is so great that amputation may be advisable, but it is to be remembered that ulceration may recur in the stump if pressure is put upon it. The treatment of any nervous disease or glycosuria which may coexist is, of course, indicated. Exposure of the plantar nerves by an incision behind the medial malleolus, and subjecting them to forcible stretching, has been employed by Chipault and others in the treatment of perforating ulcers of the foot. The ulcer that forms in relation to callosities on the sole of the foot is treated by paring away all the thickened skin, after softening it with soda fomentations, removing the unhealthy granulations, and applying stimulating dressings. Treatment of Ulcers due to Constitutional Causes.—When ulcers are associated with such diseases as tuberculosis, syphilis, diabetes, Bright's disease, scurvy, or gout, these must receive appropriate treatment. The local treatment of the tuberculous ulcer calls for special mention. If the ulcer is of limited extent and situated on an exposed part of the body, the most satisfactory method is complete removal, by means of the knife, scissors, or sharp spoon, of the ulcerated surface and of all the infected area around it, so as to leave a healthy surface from which granulations may spring up. Should the raw surface left be likely to result in an unsightly scar or in cicatricial contraction, skin-grafting should be employed. For extensive ulcers on the limbs, the chest wall, or on other covered parts, or when operative treatment is contra-indicated, the use of tuberculin and exposure to the Röntgen rays have proved beneficial. The induction of passive hyperæmia, by Bier's or by Klapp's apparatus, should also be used, either alone or supplementary to other measures. No ulcerative process responds so readily to medicinal treatment as the syphilitic ulcer does to the intra-venous administration of arsenical preparations of the “606” or “914” groups or to full doses of iodide of potassium and mercury, and the local application of black wash. When the ulceration has lasted for a long time, however, and is widespread and deep, the duration of treatment is materially shortened by a thorough scraping with the sharp spoon. Treatment in relation to the Condition of the Ulcer.—Ulcers in a weak condition.—If the weak condition of the ulcer is due to anæmia or kidney disease, these affections must first be treated. Locally, the imperfect granulations should be scraped away, and some stimulating agent applied to the raw surface to promote the growth of healthy granulations. For this purpose the sore may be covered with gauze smeared with a 6 to 8 per cent. ointment of scarlet-red, the surrounding parts being protected from the irritant action of the scarlet-red by a layer of vaseline. A dressing of gauze moistened with eusol or of boracic lint wrung out of red lotion (2 grains of sulphate of zinc, and 10 minims of compound tincture of lavender, to an ounce of water), and covered with a layer of gutta-percha tissue, is also useful. When the condition has resulted from the prolonged use of moist dressings, these must be stopped, the redundant granulations clipped away with scissors, the surface rubbed with silver nitrate or sulphate of copper (blue-stone), and dry dressings applied. When the ulcer has assumed the characters of a healing sore, skin-grafts may be applied to hasten cicatrisation. Ulcers in a callous condition call for treatment in three directions—(1) The infective element must be eliminated. When the ulcer is foul, relays of charcoal poultices (three parts of linseed meal to one of charcoal), maintained for thirty-six to forty-eight hours, are useful as a preliminary step. The base of the ulcer and the thickened edges should then be freely scraped with a sharp spoon, and the resulting raw surface sponged over with undiluted carbolic acid or iodine, after which an antiseptic dressing is applied, and changed daily till healthy granulations appear. (2) The venous return must be facilitated by elevation of the limb and massage. (3) The induration of the surrounding parts must be got rid of before contraction of the sore is possible. For this purpose the free application of blisters, as first recommended by Syme, leaves little to be desired. Liquor epispasticus painted over the parts, or a large fly-blister (emplastrum cantharidis) applied all round the ulcer, speedily disperses the inflammatory products which cause the induration. The use of elastic pressure or of strapping, of hot-air baths, or the making of multiple incisions in the skin around the ulcer, fulfils the same object. As soon as the ulcer assumes the characters of a healing sore, it should be covered with skin-grafts, which furnish a much better cicatrix than that which forms when the ulcer is allowed to heal without such aid. A more radical method of treatment consists in excising the whole ulcer, including its edges and about a quarter of an inch of the surrounding tissue, as well as the underlying fibrous tissue, and grafting the raw surface. Ambulatory Treatment.—When the circumstances of the patient forbid his lying up in bed, the healing of the ulcer is much delayed. He should be instructed to take every possible opportunity of placing the limb in an elevated position, and must constantly wear a firm bandage of elastic webbing. This webbing is porous and admits of evaporation of the skin and wound secretions—an advantage it has over Martin's rubber bandage. The bandage should extend from the toes to well above the knee, and should always be applied while the patient is in the recumbent position with the leg elevated, preferably before getting out of bed in the morning. Additional support is given to the veins if the bandage is applied as a figure of eight. We have found the following method satisfactory in out-patient practice. The patient lying on a couch, the limb is raised about eighteen inches and kept in this position for five minutes—till the excess of blood has left it. With the limb still raised, the ulcer with the surrounding skin is covered with a layer, about half an inch thick, of finely powdered boracic acid, and the leg, from foot to knee, excluding the sole, is enveloped in a thick layer of wood-wool wadding. This is held in position by ordinary cotton bandages, painted over with liquid starch; while the starch is drying the limb is kept elevated. With this appliance the patient may continue to work, and the dressing does not require to be changed oftener than once in three or four weeks (W. G. Richardson). When an ulcer becomes acutely inflamed as a result of superadded infection, antiseptic measures are employed to overcome the infection, and ichthyol or other soothing applications may be used to allay the pain. The phagedænic ulcer calls for more energetic means of disinfection; the whole of the affected surface is touched with the actual cautery at a white heat, or is painted with pure carbolic acid. Relays of charcoal poultices are then applied until the spread of the disease is arrested. For the irritable ulcer the most satisfactory treatment is complete excision and subsequent skin-grafting.